Pro Se Productions, a cutting edge Publisher of Genre Fiction, proudly announces the debut novel of one of the company’s original authors and artists today. Creator C. William Russette leaves his own definite mark on a well known genre-the vampire novel- and takes it to whole new levels in his first full length novel, SHAMANSKIN. “C.W. has been,” says Tommy Hancock, Editor in Chief of Pro Se Productions, “a part of what Pro Se has been since before it was Pro Se. He’s shown a dedication as well as an affection for the sort of stories that we want to tell. With SHAMANSKIN, he’s brought his love of several kinds of tales together and woven something that is nothing short of epic in scope. Having said that, though, he also delivers each word with the precision of a well aimed bullet. SHAMANSKIN takes hold of a reader and delivers a one-two punch that makes it so much more than ‘just another vampire book’. 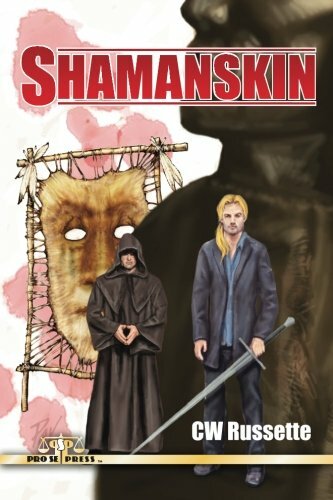 Russette turns Horror Adventure in a whole new terrifying and epic direction in SHAMANSKIN. In the supernatural halls of power in the old, dusty forgotten substructures and mansions of Philadelphia there came a whisper one day. The whisper told of an artifact that could control the dead be they vampire or spirit-kind. The two pillars of power, the vampiric House of Brittingham, and the self proclaimed defenders of humanity: the Penumbra Brotherhood, acted with an immediacy almost unheard of for either faction. Both sects needed to find the item before the other because he who holds the shamanskin controls the army of the world’s undead. The denizens of Hartshorn, PA, those that sleep above ground and those that do not, know nothing of the hell that is about to rain down on them like Heaven's ejected rebellion. It is a confrontation that will decide the fate of all humankind." SHAMANSKIN features a uniquely haunting cover by Terry Pavlet and formatting and design by David Foster. Russette’s debut novel is available on Amazon and at Pro Se’s own store (http://tinyurl.com/lk4emgb) in print now and will be available soon as an ebook on Amazon, Barnes and Noble, and www.smashwords.com. For digital review copies, interviews with the author, or more information on this work, contact Pro Se Productions’ Director of Corporate Operations, Morgan Minor, at directorofcorporateoperations@prose-press.com. TALES OF THE ROOK VOLUME TWO AVAILABLE NOW IN PRINT!